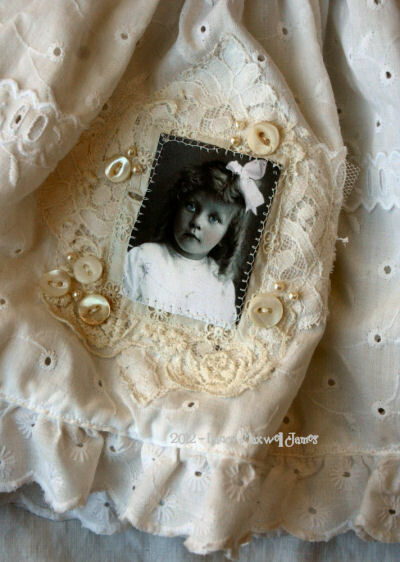 I made this little altered project using a vintage baby dress in frilly eyelet (one of my favorite fabrics) and added bits of vintage laces, mother of pearl buttons, beads and a Paper Whimsy fabric face. 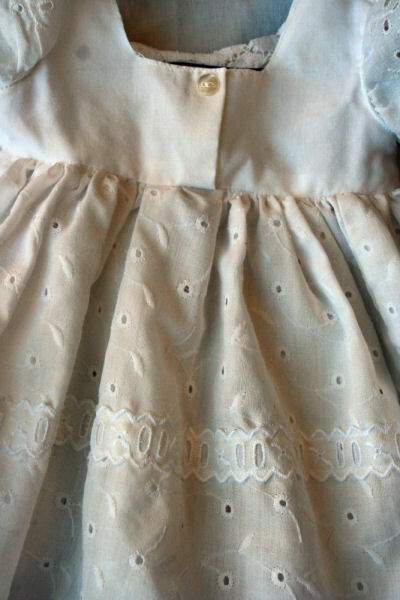 This dress reminds me of an eyelet with pink and white gingham that my daughter Allison wore at age 2. I still have it in the cedar chest (certain things I cannot part with) and hoping I may have a little grand baby one day to pass it along to wear. Happy Monday! :) I am enjoying our “winter”…cold and snow…icy roads this morning but spring is not too far away! I love your beautiful dress, great job. My new granddaughter would look precious in this!! So beautiful. I am glad you are enjoying your day, xo. Such a sweet little dress, hopefully it will inspire me make one!! Truly a charming creation Nancy,love this……. very sweet. makes me think of my daughter when she was little. Oh how darling Nancy ?? I adore what you did with that dress! It’s so beautiful! You never cease to amaze me! Oh Nancy! This is gorgeous! Luv it! what a gorgeous dress Nancy! love the laces and pearls you added! 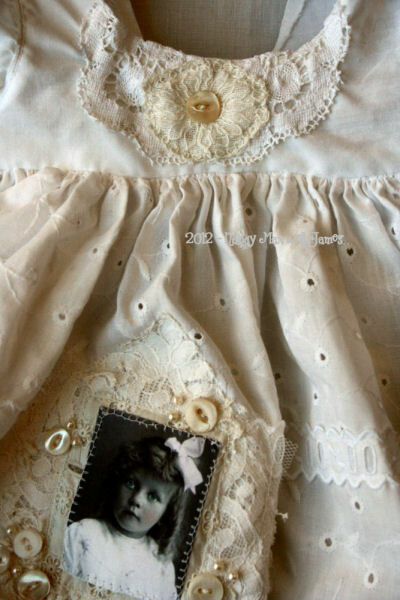 Oh Nancy how perfectly adorable… takes me back to when DD used to wear pretty frilly dresses.. I loved party days!! I adore all the detail you always put into your creations… so much eye candy to take in and drool over… stunning!! WOW so sweet and beautiful, I love that little dress! This is so adorable, Nancy! 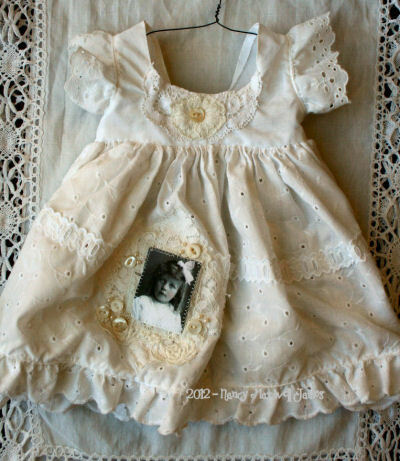 Dearest Nancy, this is the sweetest little dress- and the way you altered it ,so beautiful. I love you used a bit different whites . Send you hugs and love. Oh, this is so sweet! And . . . your future granddaughter has a treasure waiting for her! I had to take a breathe..she is just to sweet!! Just precious,dear Nancy. Love it.